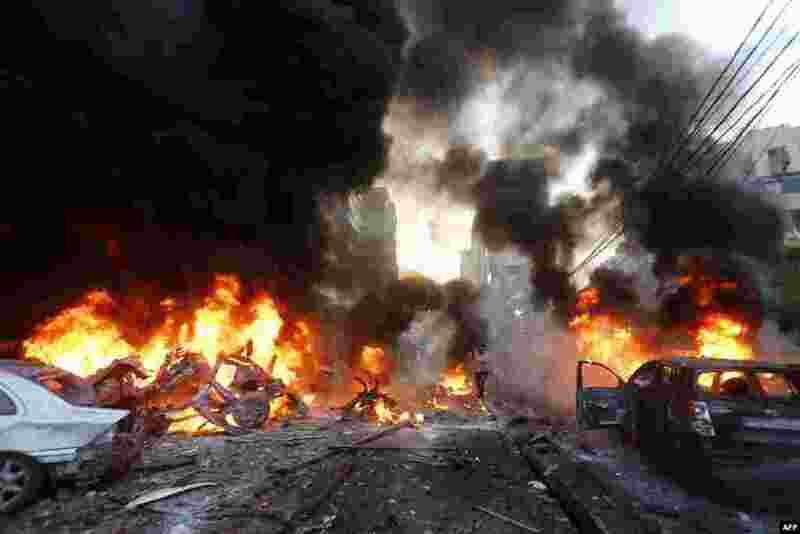 1 Flames rise from burning cars at the site of a car bomb that targeted Beirut's southern suburb of Haret Hreik, Jan. 2, 2014. A large car bomb killed five people and wounded at least 20, a health ministry source told AFP. 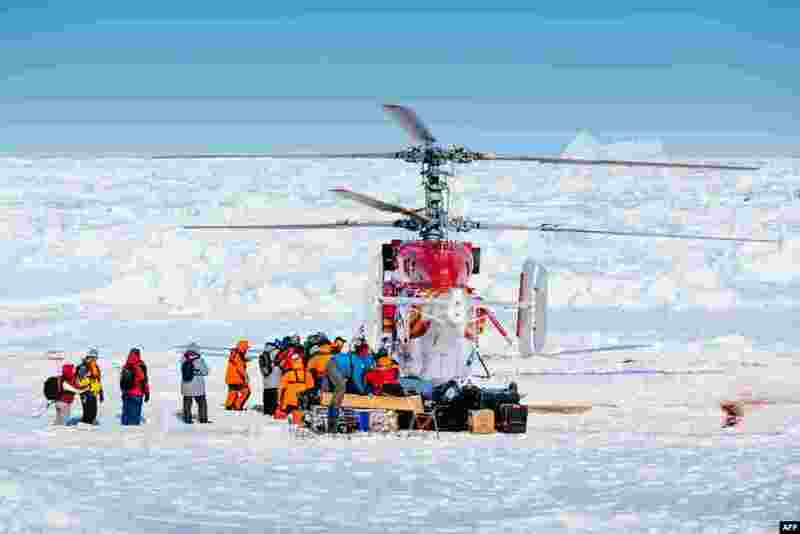 3 This image taken by expedition doctor Andrew Peacock of www.footloosefotography.com on Jan. 2, 2014 shows a helicopter from the nearby Chinese icebreaker Xue Long picking up the first batch of passengers from the stranded Russian ship MV Akademik Shokalskiy as rescue operations take place after over a week of being trapped in the ice off Antarctica. 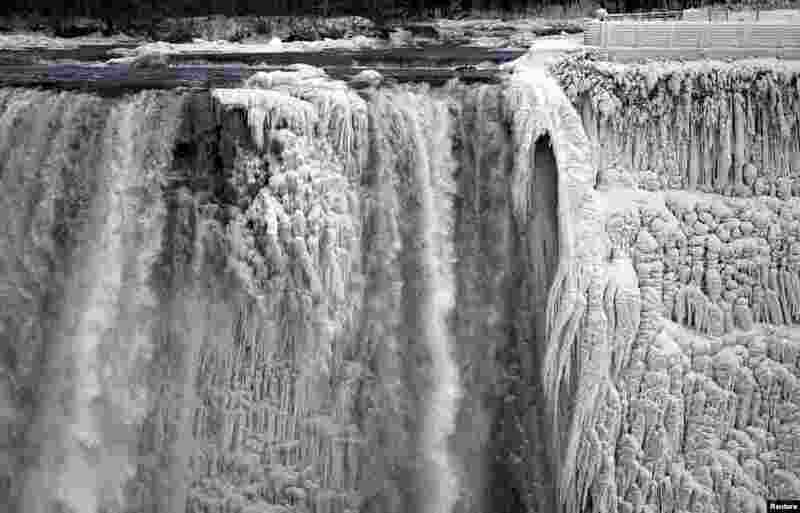 4 The U.S. side of the Niagara Falls is pictured in Ontario, Jan. 8, 2014. The frigid air and "polar vortex" that affected about 240 million people in the United States and southern Canada will depart during the second half of the week, and a far-reaching January thaw will begin, according to AccuWeather.com. 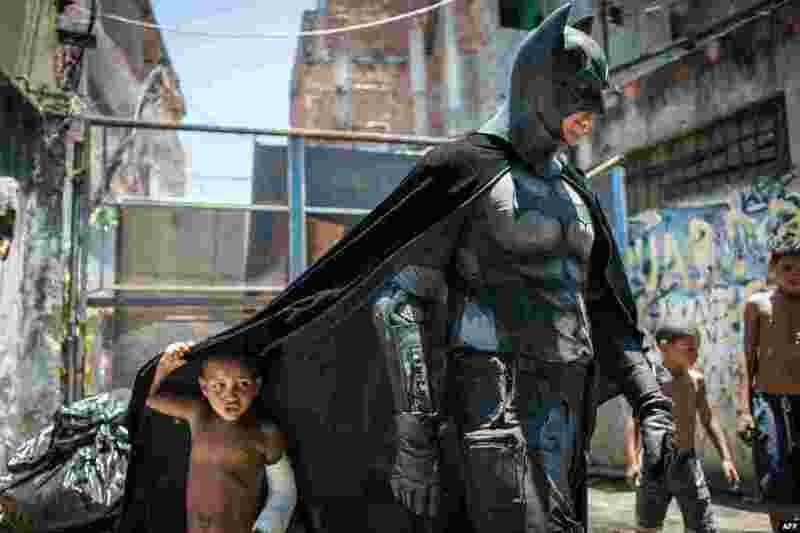 5 Children play around a man disguised as Batman at the Favela do Metro slum, area just near the Maracana stadium, in Rio de Janeiro, Brazil, Jan. 9, 2014. 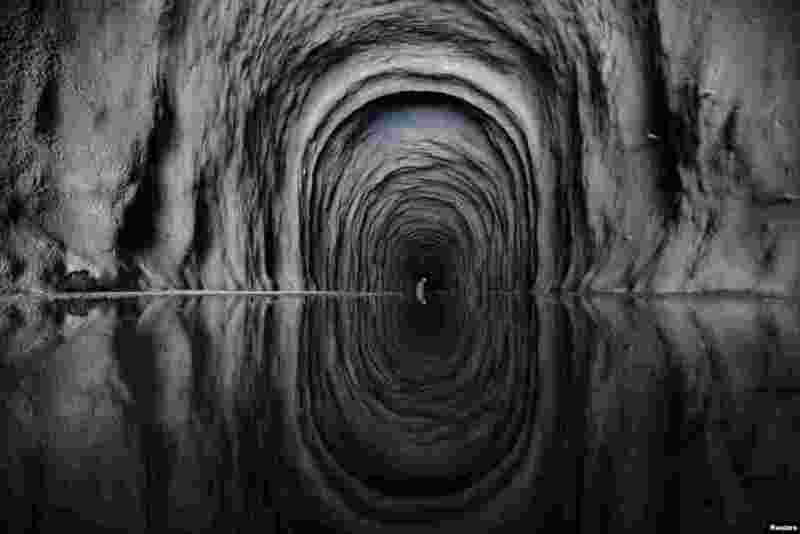 6 A worker is seen inside the Cuncas II tunnel that will link the canals being built to divert water from the Sao Francisco river for use in four drought-plagued states, a project that is three years behind schedule and has doubled in cost from the original estimate of $3.4 billion, near the city of Mauriti, Ceara state, Brazil, Jan. 28, 2014. 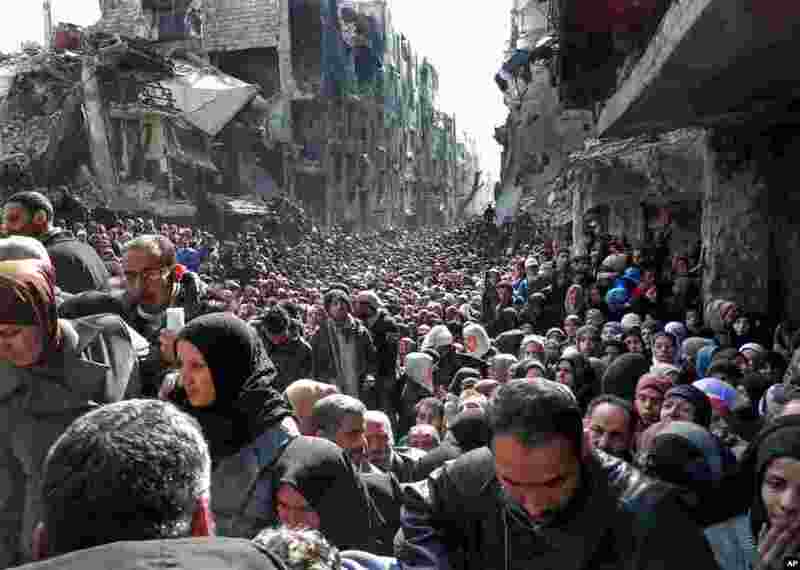 7 This picture released by the UNRWA, shows residents of the besieged Palestinian camp of Yarmouk, queuing to receive food supplies, in Damascus, Syria, Jan. 31, 2014. 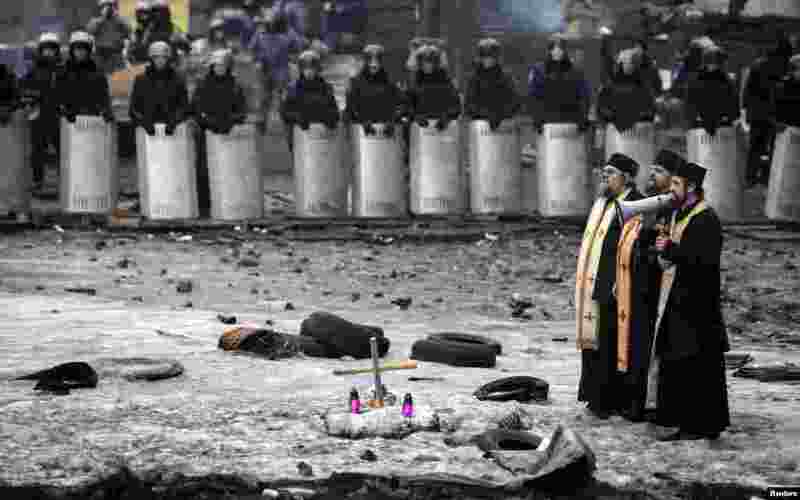 8 A priest speaks through a megaphone to riot police and anti-government protesters at the site of recent clashes in Kyiv, Feb. 12, 2014. 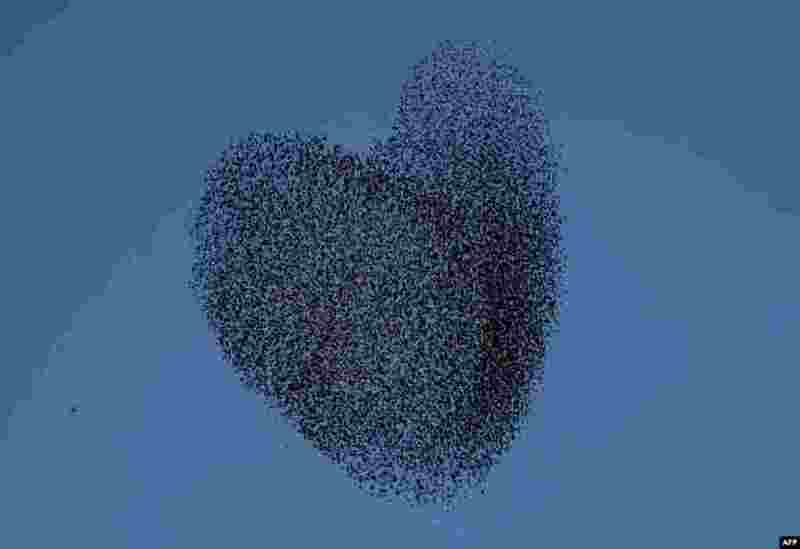 9 A flock of migrating starlings is seen as they perform their traditional dance fly before landing to sleep during the sunset near the southern Israeli village of Tidhar, in the northern Israeli Negev desert, Feb. 12, 2014. 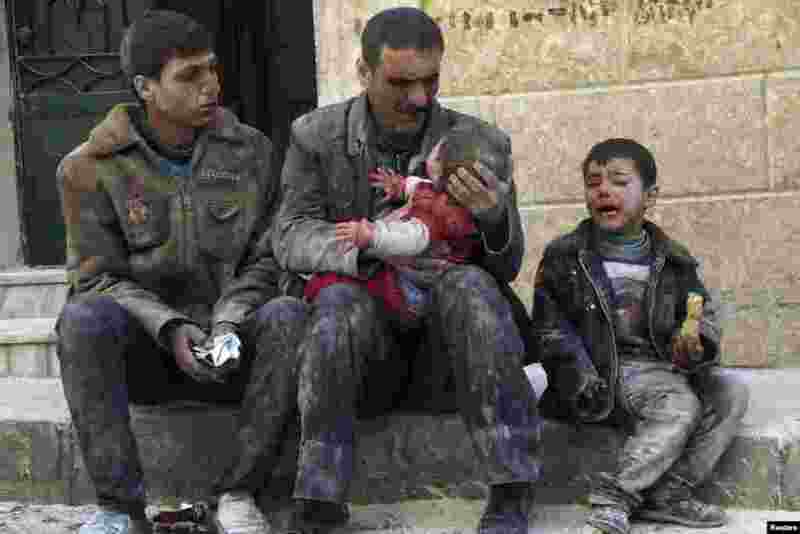 10 A man holds a baby saved from under rubble, who survived what activists say, was an airstrike by forces loyal to Syrian President Bashar al-Assad in Masaken Hanano in Aleppo, Feb. 14, 2014. 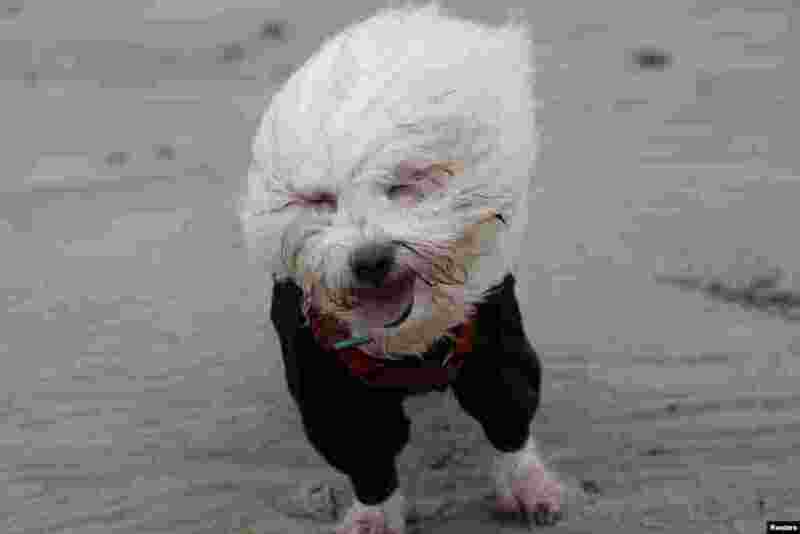 11 A Coton de Tulear dog is blown by strong winds on the beach in Lyme Regis, southern England, Feb. 14, 2014. 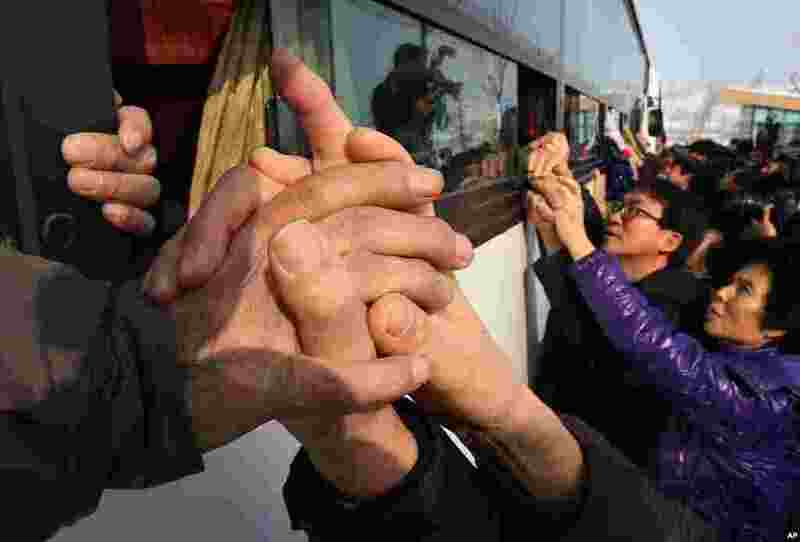 12 South Koreans hold their North Korean relative's hands on a bus after the Separated Family Reunion Meeting at Diamond Mountain in North Korea, Feb. 25, 2014. The first reunions of North and South Koreans in more than three years have been held in North Korea. 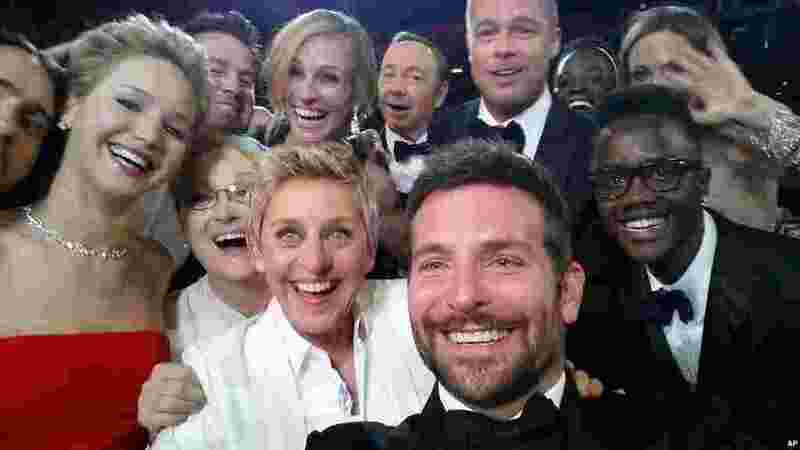 13 This image released by Ellen DeGeneres shows actors front row from left, Jared Leto, Jennifer Lawrence, Meryl Streep, Ellen DeGeneres, Bradley Cooper, Peter Nyong'o Jr., and, second row, from left, Channing Tatum, Julia Roberts, Kevin Spacey, Brad Pitt, Lupita Nyong'o and Angelina Jolie as they pose for a "selfie" portrait on a cell phone during the Oscars at the Dolby Theatre in Los Angeles, California, Mar. 2, 2014. 14 A model presents a creation of designer Iris van Herpen as part of her Fall/Winter 2014-2015 women's ready-to-wear collection during Paris Fashion Week, France, March 4, 2014. 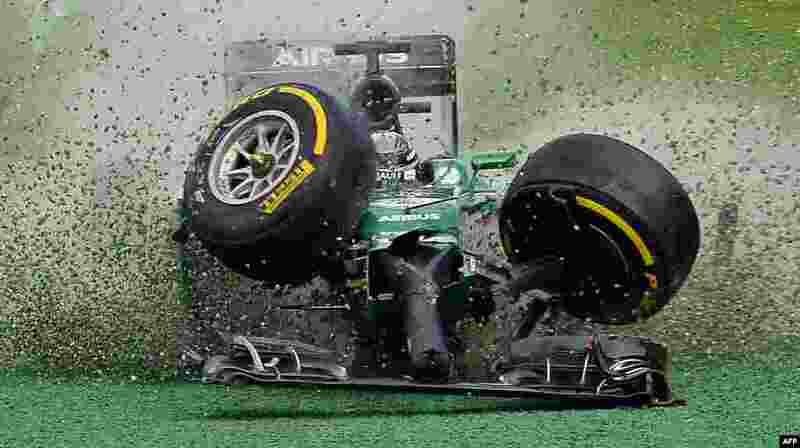 15 The car of Caterham-Renault driver Kamui Kobayashi of Japan veers off the track during an accident at the start of the Formula One Australian Grand Prix in Melbourne, Australia, March 16, 2014. 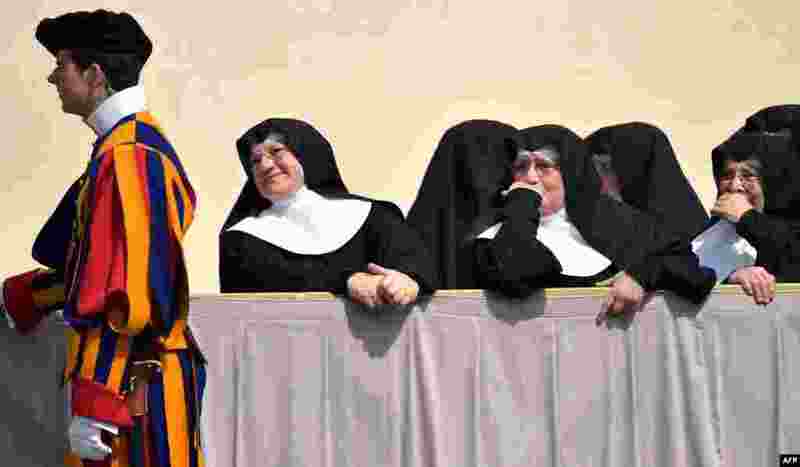 16 Nuns stand at St. Peter's square at the Vatican at the end of the Pope's weekly general audience, April 2, 2014. 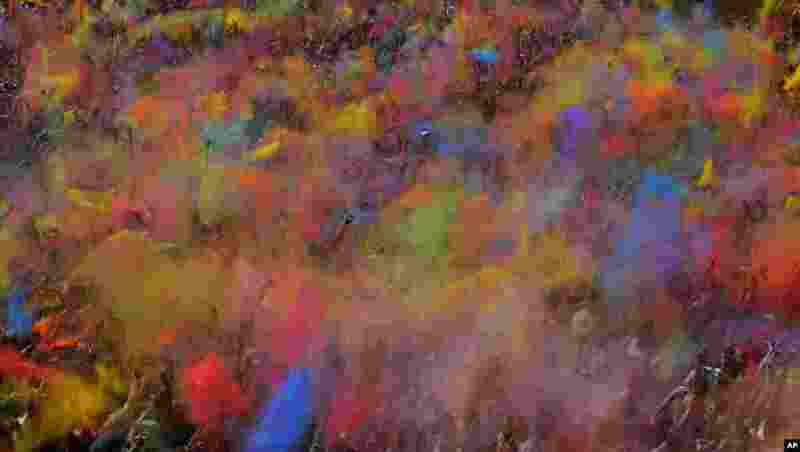 17 Visitors of the Holi Festival of Colors throw special colored powders in the air in Barcelona, Spain, April 6, 2014. 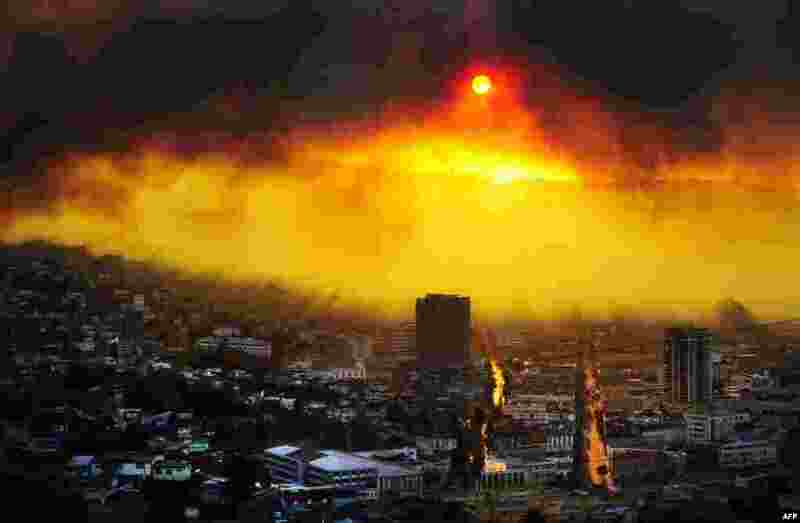 18 General view during a fire in Valparaiso, 110 km west of Santiago, Chile, April 12, 2014. The fire consumed more than 100 houses. 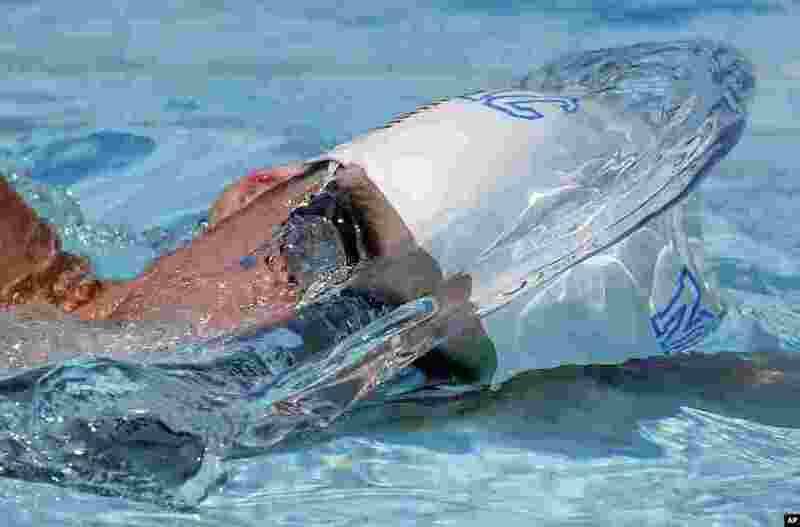 19 Michael Phelps warms up prior to a 50-meter freestyle preliminary heat at the Arena Grand Prix swim event in Mesa, Arizona, April 25, 2014. It is Phelps' second competitive event after a nearly two-year retirement. 20 Babies held by student sumo wrestlers cry beside a referee (C) clad in a traditional costume during the "Baby-cry Sumo" competition at Sensoji temple in Tokyo, Japan, April 29, 2013. 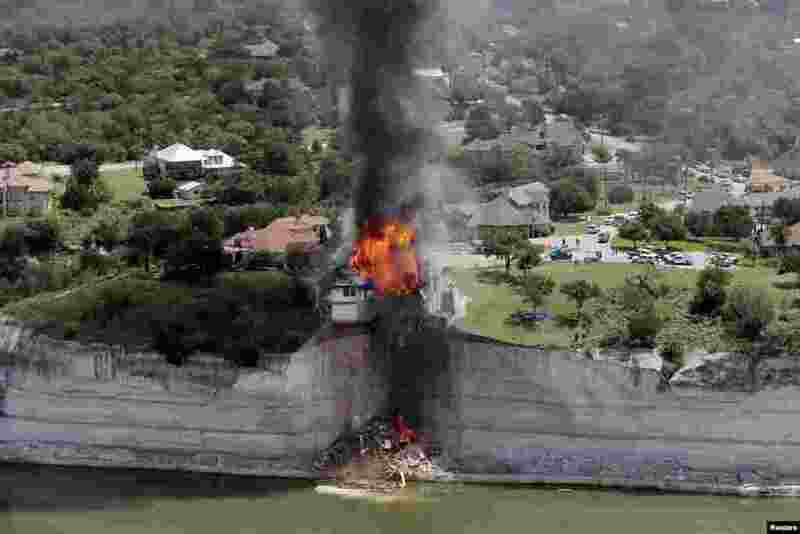 21 Smoke rises from a house deliberately set on fire, days after part of the ground it was resting on collapsed into Lake Whitney, Texas, June 13, 2014. Building crews set fire to the luxury lake house left dangling about 75 feet (23 meters) on a decaying cliff that has been giving way underneath the structure. 22 A man is arrested by security as he tries to slip under the dress of actress America Ferrera (3rd R) in Cannes, France, May 16, 2014. 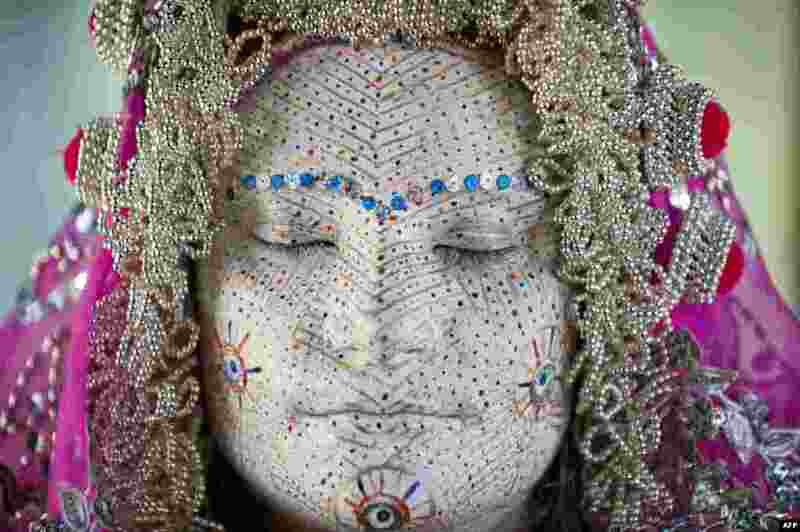 23 Kosovar Bosnian woman Arleta Sahiti 's is painted by a woman during a presentation of the traditional wedding ceremony of Bosnian women from Zhupa region at the Ethnological Museum in Pristina, July 2, 2014. 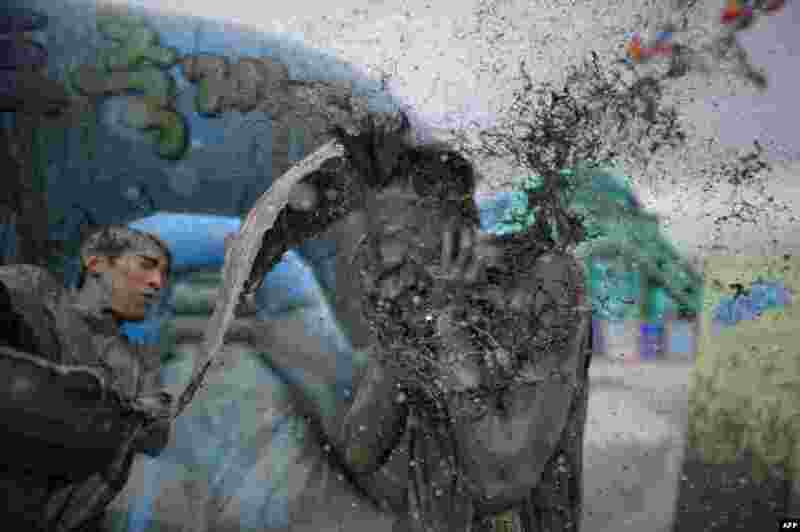 24 A reveler throws a bucket of mud during the 17th Boryeong mud festival at Daecheon beach in Boryeong, 150 kilometers southwest of Seoul, South Korea, July 18, 2014. 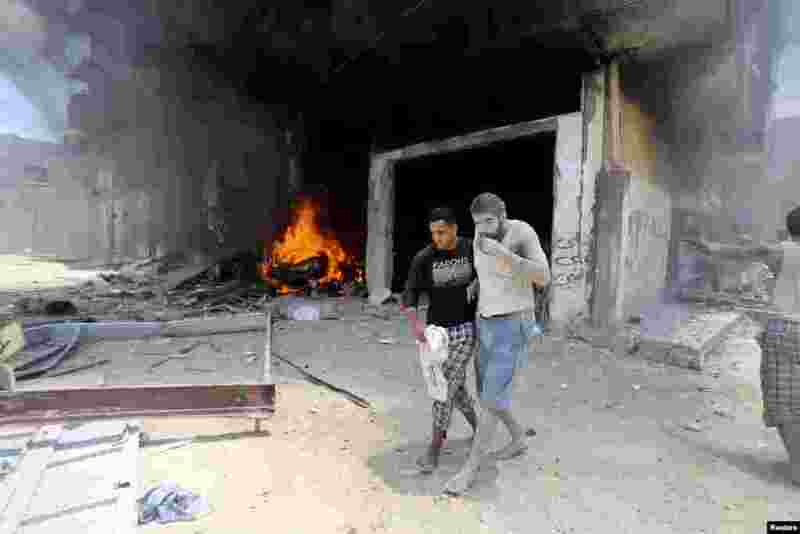 25 A Palestinian evacuates a wounded man following what police said was an Israeli air strike on a house in Rafah in the southern Gaza Strip, July 20, 2014.